Sadhguru looks at the situation when the Kauravas attempted to disrobe Draupadi, and explains how Grace functions for those who are receptive. 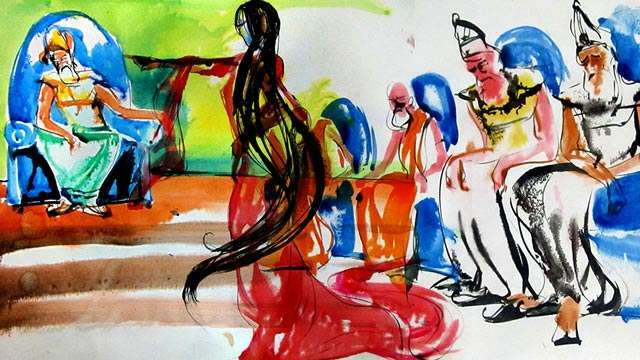 Sadhguru: Krishna was not present when the Kauravas tried to disrobe Draupadi in public. He was not even aware of the scene because when he was about to go to the Rajasuya Yagna, Shalva, a king who held a grudge against him, came and raided Dwaraka. He and his men killed people and burnt homes, cattle and everything. Those of the Yadavas who managed to escape ran into the forest and hid there. On top of that, Shalva kidnapped Krishna’s father Vasudeva and took him away. By the time Krishna reached Dwaraka, the whole place was burnt and devastated, and the survivors were all in hiding. When they saw him, they came back down. He organized the reestablishment of the community and the reconstruction of the city and sent his son to go and somehow achieve the release of his kidnapped father. Since he was involved in all this, he was not aware of what was going on in Hastinapur. If Krishna was not even aware of Draupadi’s predicament, how did he reach out to her? How did this miracle happen that she was guarded? This is a question of Grace. People constantly ask me this – some gently, some sarcastically, some in an accusing manner – how does Grace work? For Grace to function, I need not be mentally aware of what is happening to you. Through an initiation into a spiritual process, a certain investment of energy has been made, which functions as Grace. If I wish to be aware of what is happening with someone, I can be aware. But most of the time, I do not wish to be aware because too many things are going on. For those who are receptive, Grace works. For those who are not receptive, Grace does not work. Grace becomes accessible and available to you only when you create the necessary openness within you, which means you have to be willing to keep yourself aside. For Grace to function, the person who is the source of that Grace does not need to be mentally aware of the situation. The investment of energy that has been made through the initiation functions by itself. You just have to open up the bounty that has been given to you. Do not think of faith in the sense of how people are talking about miracles – they just lost control over their imagination. In his lifetime, Krishna himself generated faith in lots of people, but still not in adequate measure for who he was. That has always been so – when the greatest ones came, the greatest things did not happen because they were too far ahead. In a way, medium-scale ones did better because they operated on a level that people understand, but they could not take them to the ultimate. Grace becomes accessible and available to you only when you create the necessary openness within you, which means you have to be willing to keep yourself aside. If you say “Krishna, Krishna” and pick up a stone, it will not work. Similarly, if you say, “Sadhguru, Sadhguru” and pick up a stone, even if I want to, it will not work because Grace is very subtle. And as already said, it is not at all necessary that the one through which Grace functions is mentally aware of what is happening. That is why though Krishna was not aware of Draupadi’s predicament at that moment, still Grace worked for her. Editor’s Note: Watch the introductory episode of the Leela series, where Sadhguru explores the essence of Krishna and the path of Leela. This article is based on an excerpt from the October 2014 issue of Forest Flower. Pay what you want and download. (set ‘0’ for free). Print subscriptions are also available. Sir, this is what i learnt from all the Sadgurus I have met. May be you could use any of these techniques to make any kind of decision in your life. 1. Surrender is the most important thing. Leave every worry or problem to god/your guru. Guru/God/Grace are working from higher plane of reference and they know what is good for you and will only let things happen that will help you realize your ultimate goal. They are not bothered about your immediate goals. Always accept the problems that you come across in life with a firm belief that it is good for your ultimate goal. You will see how this is indeed true in due course of time. 2. If you dont surrender and what to make your own decision, then go with a firm belief that what ever decision you are going to take is for not for you selfish desires but for the universal good. Dont worry wether it is the devine plan that is chosen for you or not.If you take that decision with universal good in the mind then the devine plan it self will change and you will get the best result. 3. If you are stuck and cant make you choise between multiple options you have, then always choose the second best option. I hope you understand the logic here. 4. Try to be like flowing water, dont choose your option. Accept what ever falls into your lap as devine gift. 5. Follow Karma marga, Choose any option and believe that you are his representative in this universe. Give your best effort, dont worry about the outcome, Enjoy what ever result you get as his gift.Since he is the doer. I dont think there is any contradiction. We can always depend on grace, but if we are to live in this world we still need to do Purushartha, which is put effort. There is another story of a drowning man who calls for help. A boat came by to offer help, but he refuses and says "I am waiting for God to save me". Again another boat comes by he again refuses and eventually he drown. When he reaches heaven he asks God, why didnt you answer my prayers. The God replies You fool I sent you two boats! Moral is, its still up to the us to do purushartha and make efforts. Draupati was just reaping the fruit of her past karma. If god has to suffer all your karma, they why are you even here?? There is always and option to escape without harming the tiger. Isnt it? Good point, may be the effort needs to be positive in nature in order for Grace to descend. He could have looked at not harming the tiger and may be just try to escape? Right! Beautifully said. Partial faith is not good. Either have full faith or take destiny into your own hands. Agree with Presence timings more or less it happens within this time. If one is practicing Shambhavi regularly, then this experience will more longer in duration and stronger. I think most of us take Sadhguru to be a person with a gross body and then try to experience Him which is incorrect. Sadhguru is actually PRESENCE which is not within the dimension of 5 senses. Thank you... I was thinking about grace couple of days back and cried aloud... then It just dawned that I need to be empty bamboo pipe like so that my Sadhguru's grace flowd through it... I have to be empty. Right now I am full of myself. The point here is that the person who is chanting "Krishna" with eyes closed has an intention of attaining divinity and not definitely for hunting or hurting anything there. Since the intention is intense he had dropped everything before closing his eyes including his identity including all attributes to the so called accumulated self from outside and surrendered to God with full trust to get his destiny. So keeping the self aside is to keep the supreme power's Grace inside fully and thus the absolute surrender brings the greatest Trust whatever comes in the way thereafter it is only Krishna and none other than the God and similarly whatever happens to the body and mind it is because of that God only. Instead, if the person getting distraction shows that he filled up his inside with the accumulated self from outside again to pick up a stone with fear and rage and intended to hurt others. 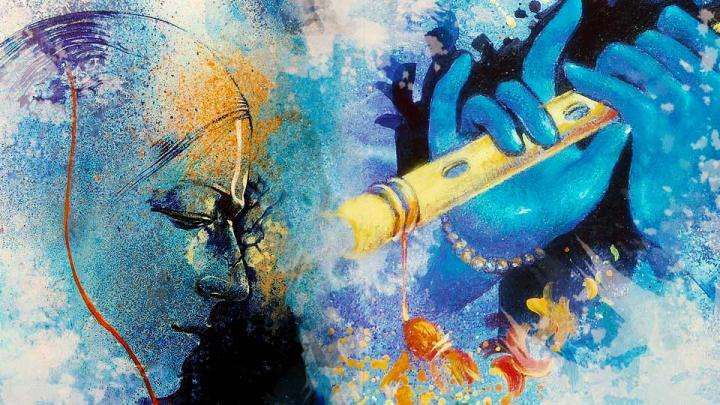 All this time his lips still chanting Krishna shows that how he deceives himself and others in the whole process of attaining divinity, hence the Grace (Lord Krishna) ignored this foolish call and did not embrace the way Draupati was saved with this Grace. was at stake. I prayed for help. I could not find help from anyone in anyform. I also thought that may be he was trying to help. I tried to find clues of possible signs to make my decision....I ended up guessing and trapped in my own mind...Sadhguru! Please reply! I am increasingly getting confused. I fear I will die one day with this confusion! Thanks Sullivan, Iswari and Ananth for a mature discourse. Faith and his grace has saved me. Namaskaram Sadhguru. Just eradicate everything that I am and create a new hollow me who is ever receptive. There is no need for anything other than grace but the foolish me!!! So just destroy me my Master! !! This is what i understood, First,All our problems can be solved if we have enough energy levels to tackle them. If incase, we encountered a bigger problem and we find it difficult, then may be our energy levels might not be enough. In that case, you either had to do meditation to buildup energy or call higher consciousness for help. This higher consciousness can be your guru (most of times) or Krishna as well. One has to ask higher consciousness only if he doesn't have sufficient energy to solve. There is no distinguish as hard or easy problem as there is no good or bad. That person might have not tried completely with his energy and just called help to higher consciousness.. Krishna started ..but when he tried to tackle problem himself, Krishna might have though..ok this person has enough energy.. let me wait. same with draupathi.. She has tried hard to stop the event happening to her.. she pleaded, begged and asked everyone in the sabha.. but no one helped.. at last she asked Krishna (help from higher consciousness). If at that point , someone from Sabha came to stop it then Krishna might not have come. still don,t get it how grace function and how to be receptive ?? Dear Friend, SADHGURU'S ANSWERS ARE CONTEXTUAL. Here, he answers HOW GRACE WORKS. So, nothing's wrong here. My understanding of the matter is... One's "self" is an accumulation of thoughts, ideas, opinions, emotions and more. If divinity resides in every being, then every life has the possibility to prosper in the most beautiful way. Yet what hinders is that "self". By asking us to putting "ourselves" aside, Sadhguru wishes we offer the divinity within the chance to take over. An initiation by Sadhguru is His infusion of His Life Energy in us, which is Grace. Grace lets us know the Divinity within, which was until then only a dormant idea. So, putting "self" down, one harvests boundless Grace. The Divinity within begins to function and that looks miraculous. There's no promotion of any belief. Also, there's no praising for lethargy or negligence here. There's just one point that the story makes here and that's this: trust. I'm not talking about believing or disbelieving. For me, trust isn't synonymous with "believe", its allowing the Ultimate to take charge. Thus, trust does obliterate any hurdle. Absolute trust is all that's needed. I can also call trust "Bhakthi Marga" or the path of devotion. In it, one absolutely dissolves one's "self"(the self I talked about in the 1st line) and enjoys the divinity's expression in life. 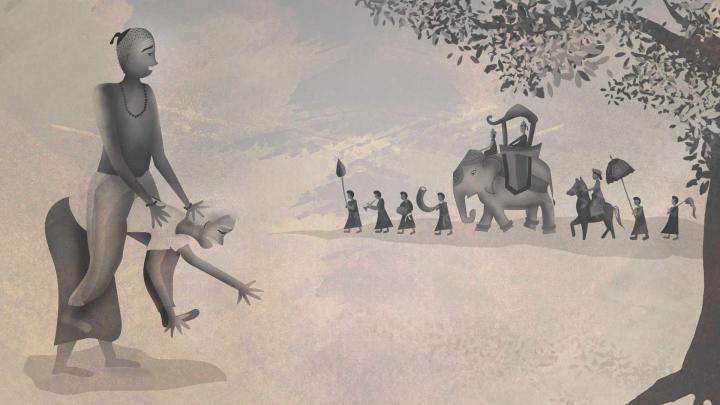 Now, getting out of the context, moving out of this blog post... As you and many feel, Sadhguru considers a mix of all paths of Yoga necessary. (Check out his book "Mystic's Musings".) Karma Yoga(activity), Kriya Yoga(energy), Gnana Yoga(intelligence) and Bhakthi Yoga(devotion) together make life. Back to this post, I repeat what I said as its expected to be clear now: "THERE'S NO PROMOTION OF ANY BELIEF. ALSO, THERE'S NO PRAISING FOR LETHARGY OR NEGLIGENCE HERE". My reply to you is purely based on what I read in an Isha's book titled "A Guru Always Takes You for a Ride"(http://www.ishashoppe.com/USA/a-guru-always-takes-you-for-a-ride-929). Its one of Isha's beautiful publications and I treasure it so much for the life lessons learnt. I hope to get across His words rightly and continue... He says without the necessary maturity, if one ends up enjoying something in life, what should have been a treat turns into a poison. Manipulation of life's events and prayers answered can present one the greatest gift out there, but without the necessary maturity to experience the gift, the boon becomes a bane. So, what's the way out? Well, it is to simply bask in His Grace. Yes, Sadhguru wants us to make use of the spiritual possibilities(such as Himself, Dhyanalinga, Temples etc.) in the way its meant to be made use of. Instead of thinking of our needs, we need to simply sit there(meditate). The energy of a spiritual possibility is such that it provides us with the maturity that one is in need of. As a result, the needs are met and there's no misery. Sadhguru is the Ultimate possibility. He is ever available to us. For any of us who feels not so receptive, I'm sure His Presence is more strongly felt from 6:15 pm IST to 6:45 pm IST. He has said that wherever He may be then, He lets everyone of us know His Presence. You could make use of this opportunity. If you wish, you could check my other comment on this same page. I have shared what I knew with Him about trust and Grace. Hope that to be of some use to you. Krishna is omnipresent, no? He should have known about Draupati's plight even before it happened,no? Geetha prescribes "sirf karm kar, fual ki apakesha maath kar", then how was it ok to not do anything about the tiger?! From my personal experience; surrender is good. I become quiet and release all that is I am trying to control in my mind and life...because I understand that my control is just an illusion. I pray and release my "challenges" to the Divine universe because ultimately I know I do not control anything. In my heart I allow love to fill me and I think about Sadhguru / God, everyone that I love, I then extend that love out to embrace everyone. I feel gratitude and I thank God / Sadhguru for every blessing and miracle known or unknown to me. This is a beautiful state to be in and I am usually overwhelmed by then...just allow yourself to stay in that gratitude, feel the love and thank God / Sadhguru. Pray and release your problem to the Divine universe and trust that it will be taken care of because you are a creation / child of the Divine. In my experience the Divine Mother/Father always takes care of me and Divine Grace flows endlessly in my life just as it does in yours. Release your attachment to any outcome because the Divine works in mysterious ways. If you cannot control your life, then get yourself out of the way so God/Divine/Sadhguru can come in and do the driving... get on the bus. Love and Blessings to you. I don't understand this. Sadhguru himself has said many times that we have to do the right things to be successful. If there is a tiger in front me, If I still sit there without doing anything and chanting Krishna Krishna is like - expecting to pass an exam sitting at home and chant Krishna Krishna. There is a story. There was once a man. He wanted to win a lottery. He prayed a lot everyday and night, but he did not win the lottery. He kept on praying the God. One day God appeared before him and said. "I want you to win the lottery as you wish, but to win the lottery for heaven sake go buy a lottery ticket". I understand what Sadhguru is trying to say here which is "We have to have full faith and be open minded to receive the Grace", but somehow the story does not really make sense. I didn't understand the story. What the man was supposed to do? Always be careful what you which for. 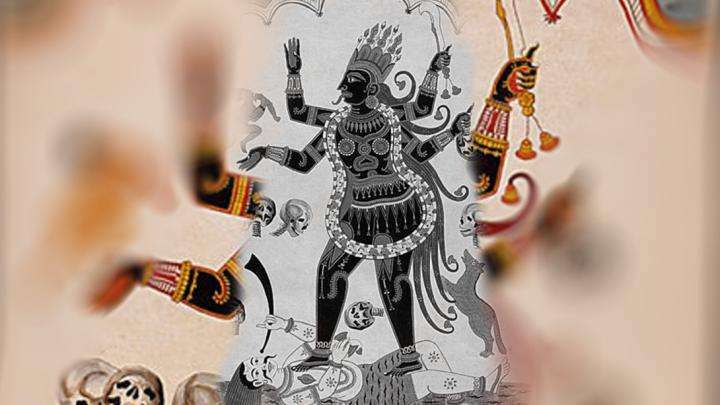 What is the significance of goddess Kali and her fearsome depiction? Sadhguru speaks about the origins of Kali.